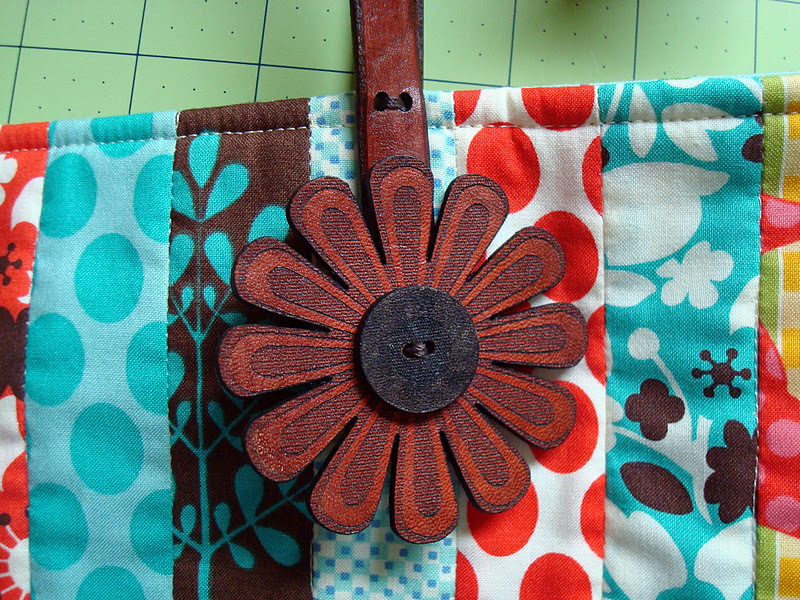 cute cute bag - Stephanie creates nothing but awesome patterns. You sure are lucky to be a Supreme ! That bag is adorable! I had to tell you about my Anna. My great-grandmother was a Swedish immigrant and her name was also Anna. When she and Gus (my great-grandfather) arrived in Texas they changed their last name to Westman because they had become Americans. They spoke Swedish to each other but only spoke English to their children-which drove the kids crazy! After my grandmother and her siblings grew up, they all studied Swedish so they could learn what their parents had been saying all those years ago. I love to hear the history of what is behind the design, plus I love the fact she used corduroy on the bottom of the purse!! What a lucky and fun job you have! Lovely story of your grandmother. I enjoyed reading this. Thanks for sharing. And, Stephanie's bag is awesome. Cute bag and a great story. My maternal grandmother was Anna also. Her story begins with her birth in a covered wagon somewhere (I haven't beena ble to track it down) in Washington Territory (?) in Iowa. Thanks for the chance to win and the chance to meet your Anna. VERY pretty bag and a wonderful story about your Gramma. Thanks for the chance to win! Lucky you who could try this beautiful pattern as the first. What a fun job you´ve got! My daughter´s name is Anna. Thanks for the chance to win! Thank you for the story of Anna. I live in Seattle and collect these stories and this is a GREAT one. LOVE LOVE LOVE the bag. Practical AND cute! Wonderful bag! I like it! Your version is just waiting for Spring! Very lovely. Thank you for your story about your Anna. Love this bag - my grandmother was an Anna also - and my name is Anne - would love to make this bag not only because of its name but also because it is a lovely design. Life a genration back or 2 were very tuff!! My Great Grandmother came thrue Ellis Island twice . The first time she came with her husband and she had her first son born in Brocklyn my Grandfather, after a couple of years she became pragnent again, but her husband went missing. She had to return to Norway and came home 7 th mounth pragnent and gave birth to a little girl. After a while she travelled another time, with her 2 children, back to New York, the year is 1910. She returned to try to find her husband but did not succeed. She actually gave up and returned to her family in Norway, put her small children at her parents house and became a servent a long way from her children.. Sad story realy!! I do love your new Anna Bag, the fabrics and colours are perfect!! 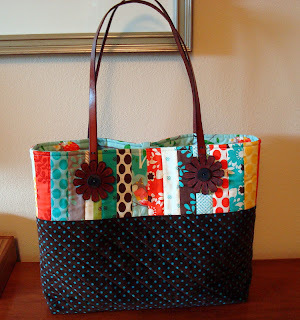 I might just have to make this one sometime..
What a cute bag. Love the story of your Gramma too. It's great to tell others where you come from. So many have done the 12 days, your fabrics are fab. I resisted, but started Just Takes 2. If it's not one project, it's another! Happy New Years to you. What a cute bag...love the fabric as well!! I swear Stephanie and you make a great team!! Well done to BOTH of you quilting divas!! I love this bag. The colors you used are right up my alley. You are so lucky to be a Supreme. What a wonderful history about your grandma! She sounds like she was a wonderful person and I take my hat off to her for having the courage to make the long (scary!) trip to Seattle by herself! Thanks so much! Loving it and your connection with Anna as a name also. Thanks for giving me a chance to win! This a really cute bag. Love your colorful version. Found your grandmother story very interesting. Thank you for sharing. What an amazing history your family has! You must be so proud! 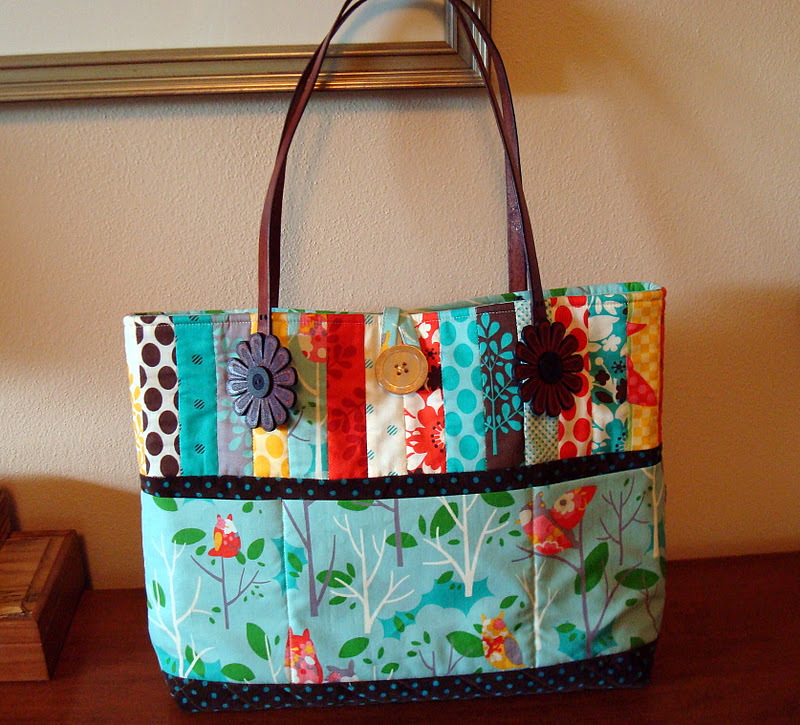 The bag is cute and the fabrics are gorgeous! Thank you for sharing the story about Gramma Anna. She was an amazing woman to immigrant here all alone in those days and then be independent enough to raise her children on her own. Strength at its best! Cute bag! The handles are adorable. Thank you for offering the give-away. Oh wow!What a wonderful family story. I can see this story written by Nora Roberts or another author for a historical romance novel. What a wonderful story about your Grandma. Can you imagine traveling all that way alone, and then to have someone steal everything you own. What a story - thanks for sharing! And...your bag is wonderful! Beautiful bag and great story on your Gramma! How amazing that would be, taking a trip in a foreign country with not a word known of another language. Great Story! I've also enjoyed reading the comments from other people about their ancestors! Your grandma is really beautiful. Anna is my best friends name! Nice! I'd love to win a book about Anna... My Mom is Ann, my sister is Annette, and I am Anita... Anita Catherine that is. Love the bag-- it's beautiful!! Thank you for the chance to win!! I love this bag-especially the back! And the handles are just wonderful. I loved hearing about your Grandmother, my Great Grandfather emigrated from Scotland about the same time and was only 12 when he came over by himself (he followed several brothers & one sister who emigrated first). Happy New Year! Another year for us to sew and quilt! Thank you for sharing your lovely story. The bag is so so cute! Candace, this is just too cute! Love the handles you found too - I've pinned them for future use. I enjoyed reading about your Anna! What a great bag, and those handles! Wow! Loved the story about your grandma, and the fabulous photo. Wasn't she pretty? How wonderful to have that much information about one of your grandparents. My family on my father's side are all immigrants from Poland and Russia, but very little is known about them. What a beautiful version of the Anna bag! And what a lovely story that goes along with it. Just love Stephanie's new bag! !